Correctly installed hose will help ensure safe use and extended life! Do not install hose with residual torque. Use flanges or swivel fittings on at least one end of the hose. Avoid short straight hoses that do not have enough length to provide good flexibility; it's better to have a small radius in a longer hose than a perfectly straight hose that can suffer axial tension. Axial misalignments should be avoided particularly in short hoses or ones with relative movement between each end. If the ends of the hose may move relative to each other then make sure the hose flexibility is not axial along the hose. Use elbow fittings instead of allowing the hose to bend sharply. Hose bends must not fall below the minimum bend radius of each hose type. Make sure fittings allow the hose bend equal or greater than the minimum bend radius. Try to ensure hose bends are in one plane only. Never allow bends or tension against the fitting ferrule itself. Always remember that poor installation ill reduce hose life and increase the risk of failure. Ensure all loads are supported, the pump is locked off and sufficient containers are available to collect the escaping fluid for environmentally safe disposal (do not reuse). New hoses must be flushed clean and the ends kept sealed with mechanical covers, before fitting. 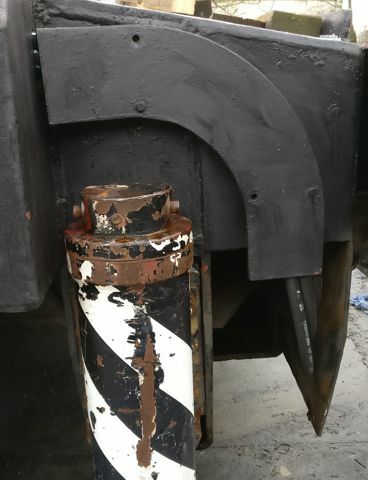 Over 90% of all hydraulic failures are caused by contamination of the fluid so keeping your fluid and equipment clean will mean it is much less likely to break. Saving significant time and money. Hoses typically have a shelf life of 10 years maximum. The cure date should be written on the side of the hose. For safety reasons we recommend hoses are replaced at regular intervals. 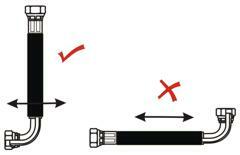 The hose replacement times will vary depending on duty, environment, risks from failure etc. but this may be as low as 3 years in some cases. If people can get within 100mm of your hose then consider putting protection around it to guard against oil injection injuries. You can see a good example from a lorry crane here. Here is another example where the hose is protected against oil jets and wiplash.